Aquaponics is the combination of intensive aquaculture and hydroponics and is among the most efficient of all food production systems. The three important elements in any Aquaponics system are plants, fish and beneficial bacteria. Put simply, you feed the fish, the bacteria turn the fish wastes into plant food and the plants clean the water for the fish. 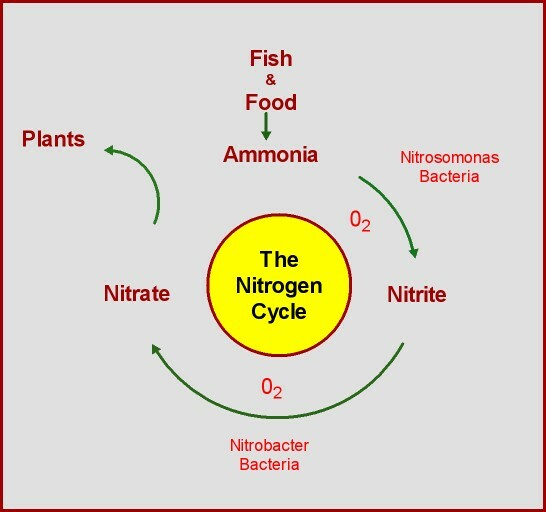 Arguably, the nitrogen cycle is the most important thing to be understood about Aquaponics. When the nitrite levels in the water reach a certain point, other bacteria (Nitrobacter) begin to colonise the system. These bacteria convert nitrites to nitrates (NO3), which are less harmful to the fish. While the microbiology associated with aquaponics is complex, the equipment needed is very straightforward. In a conventional recirculating aquaculture system, nitrates are removed through water replacement where a predetermined volume of water is dumped each day. In a conventional hydroponic system, inorganic salts are used to provide nutrients for plants. Once the nutrient levels drop below a certain level, they are also dumped. In both situations, the wasteful disposal of nutrient-rich effluent creates environmental issues. The addition of a hydroponic growing system to a basic recirculating aquaculture system (tank, pump and bio-filter) is what creates the microbiological miracle that we know as Aquaponics. Our original Aquaponics system comprises an 800 litre tank, two small trickling bio-filters and a couple of small pumps. We housed the system in our shed which enables us to control the production parameters more effectively and to stop leaves from blowing into the tank. A diverse range of hydroponic systems can be used for Aquaponics. Since they all grow plants, the choice of a particular system boils down to personal preferences and the availability of resources. Regardless of the choice of growing option, Aquaponics is sustainable on several fronts – it requires less water and it does not pollute the environment – and nor do we need to purchase expensive inorganic salts for our plants. The smallest traces of herbicide, pesticide or even garden fertiliser will prove toxic for fish so these chemicals have place in Aquaponics. Clean food is the result. Initially, we used a combination of flood and drain gravel grow beds and non-recirculating coco-peat tubs and trays. These days, we largely use media-based grow beds filled with expanded clay. While Rainbow Trout is not native to Australia , it can be grown in cooler climates and is an excellent eating fish. We chose Jade Perch for our initial fish production efforts. They are hardy natives that are well suited to backyard Aquaponics. While they are more demanding in their management, we’ve now also grow out Barramundi and Murray cod. Pelletised rations, specially formulated for native freshwater fish, are available from fodder stores. We supplement the pellets with duckweed and Black Soldier fly larvae. Many plants can grow in an Aquaponics system. Last season, we grow lettuce, soft herbs, silver beet, bok choi, beetroot, onions, tomatoes, capsicums, broccoli and zucchini. We were eating bok choi and coriander within three weeks of planting the seedlings and we began to harvest silver beet a week later. Our experience of Aquaponics has been overwhelmingly positive. The secret to its success is the way that it mimics nature in its integration of fish, beneficial bacteria and plants. It’s a tiny eco-system where the only ongoing inputs are fingerlings, seeds, fish food and far less water than would be required for many other plant growing methods. Each day, we harvest useful quantities of clean, fresh vegetables and herbs and, whenever we feel the urge, we eat freshwater fish. hi ,im interested as am doing hydroponics myself in sth aust and finding some supplies of stock is a problem , eg silver perch . i assume you are in the eastern states ? i have heard that the use of NFT deep channel is the go , why not NFT ??? problems ??. i will now start looking for info on the “red claw” as well , you have re stired my interest in this as i have a plastic lined 5000 lt tank standing idle and fish is so expensive and yabbies i not seen in a long time . L Hare……I live in Queensland so I have good access to most species of freshwater fish. Ausyfish is my preferred supplier of fingerlings and they ship all over Australia. You can buy Barramundi from West Beach Aquaculture. I have a small NFT unit and I’ve used it to successfully grow lettuce and soft herbs. The only issue with NFT is managing root zone temperature and I keep that under control by keeping the length of the troughs at about 2 metres. I suggest you talk to the local DPI office about whether you can keep Redclaw in SA. Yabbies are a good locally available alternative anyway.